Return to a time of casual elegance. Inspired by the grand and gracious seaside homes of the early 20th century, Disney’s Beach Club Villas will transport you to a world of idle days and balmy nights. There’s a light, comfortable ambiance characterized by pastel colors, wooden porches and decorative trim. 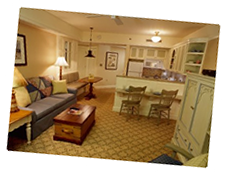 Guests will enjoy all the modern day amenities of Disney’s Yacht Club and Disney’s Beach Club Resorts right next door. Shared with Disney’s Yacht Club Resort, Stormalong Bay is a sand-bottom pool with a waterslide, lazy river, 3 whirlpools, and a kiddie pool. 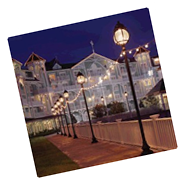 Cape May Cafe hosts the Beach Club Breakfast Buffet each morning with appearances by Goofy, Donald, and Minnie Mouse. Characters subject to change.